With the Enviro Save Water System, every time you turn on a hot tap, water in the hot water line passes through the thermal valve. 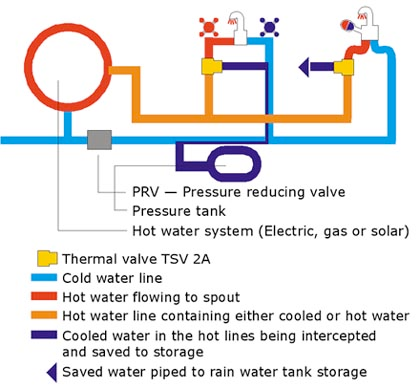 The initial flow of water, which has cooled in the lines, is diverted back into the cold water lines and stored (either in a pressure tank [System A] or a rainwater or other suitable container [System B]) for reuse. When water arrives at the correct temperature the thermal valve switches, directing the hot water immediately to the spout or shower rose. The first drop of hot water out is at the right temperature, and the cooled water is automatically saved.